Located at 297 River Valley Road, Five & Dime Eatery is easily one of the prettiest restaurants in town. Even though Five & Dime has only been around since the start of the year, it has already garnered a strong following, which is no mean feat considering the number of new restaurants and cafes. Several of my friends were turned away when they went there without any reservations during the weekdays. And for weekend brunch, they offer three different seating at 10am, 12noon, and 2pm – a testimony of their popularity. After going there for brunch recently, I can understand why they are so popular. While the food is not out-of-this-world good, I love the dining concept, and I had an enjoyable experience there. I am going to go out on a limb and say that Five & Dime Eatery is one of the best new restaurants in 2012. I love that Five & Dime has a New York vibe; I love that they have put in a lot of attention to detail in the design of the place; I love that it is a standalone building on a quiet stretch along River Valley Road. I also love that the restaurant is versatile; bright and airy for a nice Sunday brunch, and when night falls, I can imagine it transforming into a classy and elegant place for a romantic dinner. The restaurant has a simple menu, with a few choices under each category. The buttermilk pancakes ($15), corn beef hash ($18), and French toast ($15) caught my attention. I was also tempted by the churros ($8) and pandan creme brulee ($12) under the dessert menu. In the end, we decided to share eggs benny ($16), big brekkie ($22), and mentaiko pasta ($22). 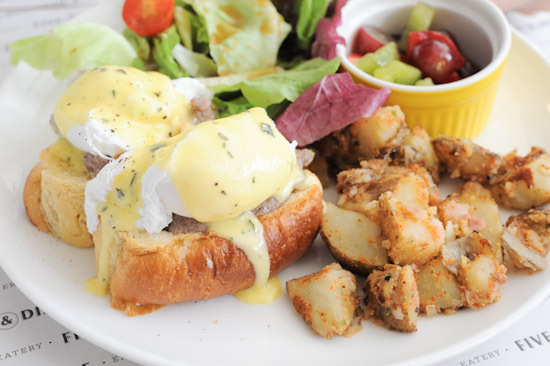 The eggs benny is slightly different from the usual ones; the beautifully poached eggs come with seared beef, and a healthy serving of fresh greens. I think it is good enough to be in my list of best Eggs Benedict in Singapore. Do try it and let me know. The big brekkie — which you see in the first picture of the post — was reliable. 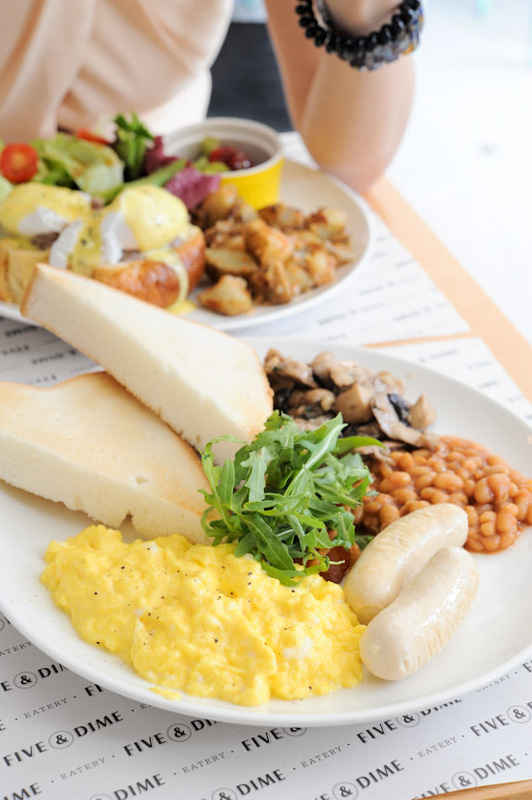 It came with the usual scrambled eggs, sausages, beans, and toast. Not life changing good, but good enough for a lazy brunch. There are not many places that serve mentaiko pasta, so when I saw it on the menu, I knew that I had to order it. Five & Dime’s rendition was creamy, but not too heavy. The yakitori, on the other hand, was only passable. In general, I liked it enough for me to order it again on my next visit. For dinner, Five & Dime has comfort food like mac & cheese, burger, fish & chips, and pasta; most of the items are priced in the acceptable range between $20-30. If you are working in the area, you will be happy to know that they have a pretty decent lunch menu (price ranges from $6 for a soup, to $14 for a sandwich, and $18 for pasta). Thank you for reviewing this place. I have passed by it a few times and I’ve been curious. it sounds like a good place to try for lunch. Would you recommend it for brunch only? Or dinner as well? No. Just a big resounding NO to this place. The fish and chips was really awful and everything else we tried was just under seasoned, over seasoned or just didn’t justify its price tag. There are better places to eat brunch in Singapore. Don’t waste your stomach space on very average pseudo pub grub such as this. Worse. Experience. Ever. I believe there are other brunch places where you could get way more decent food. Besides its exterior, this place is indeed overrated. You are right about the food. It really is just ‘meh’. The interior, though pretty, is not a good place for nice long chats with friends because of the poor acoustics. I thought it was noisier than a kopi tiam.